As I write this sentence, my e-mail application’s inbox is empty. In fact, it’s almost always empty at the end of the day. This seemingly amazing feat didn’t require a great deal of technological sophistication, organizational wizardry, or monklike discipline. I simply decided an empty inbox was necessary to preserve my sanity, and through trial and error—along with some helpful hints from productivity experts like Merlin Mann and David Allen—I eventually settled on a simple system that makes it possible. 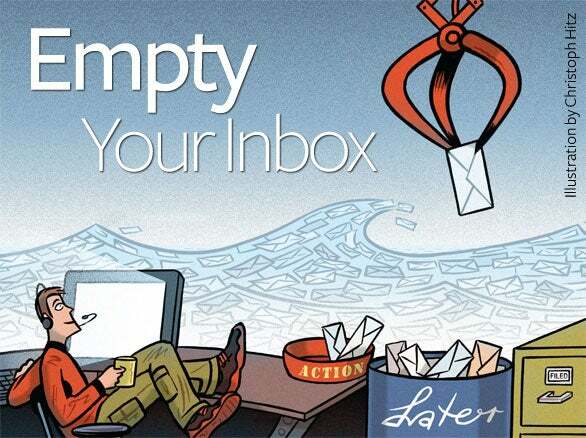 Maintaining an empty (or nearly empty) inbox can make you more productive, result in fewer lost messages, and reduce stress by letting you focus on your most important e-mail. While it may take some initial effort to get there, changing the way you deal with e-mail doesn’t have to be difficult. Over the next three days, I’ll show you how to clear out your overflowing inbox and help you rethink the way you deal with e-mail. We’ll start with strategies for reducing the amount of mail you receive in general. Then in future installments, I’ll introduce you to a simple filing system that will help you focus on the mail that deserves your immediate attention and power through the mail that doesn’t. I’ll also show you how to deal with the backlog of messages currently cluttering your inbox. Although a few of my suggestions involve taking advantage of new features in Apple’s Mail 3 ( ) and Microsoft Entourage 2008 ( ), you can put most of my advice into action regardless of what e-mail client you use.